Coinciding with new displays of Oceanic and Indigenous Australian art at the Art Gallery of NSW and at the Australian Musuem, this two-day forum will focus on how collections of art from the region have been formed and re-defined. Speakers include Maia Nuku (curator, Metropolitan Museum of Art, New York) and Jonathan Jones (Wiradjuri/Kamilaroi artist and curator). On Sunday 3 February the Gallery will host a series of free events including a curator tour of the exhibition Melanesian art: redux , a choir performance and a screening of selected footage from the National Film and Sound Archive. The symposium is co-presented by the Art Gallery of NSW and the Oceanic Art Society. $180 concessions, members of the Art Gallery Society and the Oceanic Art Society. $90 concessions, members of the Art Gallery Society and the Oceanic Art Society. This talk will discuss the complex relationship and responsibilities of the museum and its custodianship of cultural collections in the context of imagery and expression. 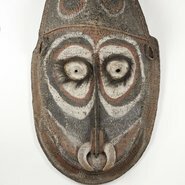 This will including looking at the Holosa (spirit) better known as the Asaro Mudmen Mask, one of the greatest treasures of the Australian Museum. Dr Michael Mel is of the Mogei tribe in the Highlands of Papua New Guinea (PNG). He completed a PhD from Flinders University in South Australia and has worked to promote indigenous art through teaching, writing, curating and performing in PNG, Australia, New Caledonia, the UK, Canada and the US. His most recent engagement was, for eight years, as Deputy Vice-Chancellor (Academic) at the University of Goroka, Papua New Guinea. He is currently a manager for Pacific and International Collections at the Australian Museum. This lecture will outline the history of the extensive historic collections held at the University of Sydney. These include antiquities held in the Nicholson Museum, ethnography, natural history and history collections held in the Macleay Museum, and the University Art Collection. It will also introduce the development of the Chau Chak Wing Museum scheduled to open in 2020 that will bring together these collections into a new purpose-built museum and cultural precinct. David Ellis is Director of Museums at the University of Sydney. Previously he was program manager for museums, Arts NSW (1996 – 2003), director of exhibitions, National Library of Australia, project manager, Art Exhibitions Australia, and curator of exhibitions, Tasmanian Museum and Art Gallery. As an artist, he has works in national, state and regional collections. In mid-2019 a major publishing project will result in a remarkable book on the arts of the Sepik region of Papua New Guinea. This project will present otherwise little known and unpublished 19th and early 20th century masterpieces from a handful of well-known private European collections. Crispin Howarth is the curator for Pacific Arts at the National Gallery of Australia. A previous president of the Oceanic Art Society, he has travelled in the Ramu and Massim areas of Papua New Guinea to learn about the arts of these regions. For over 15 years he has curated numerous exhibitions and published over 80 articles on Oceanic art. The publications he is most proud of are Varilaku: Pacific arts from the Solomon Islands (2011), Masterpieces of New Guinea art (2014) and Myth and magic: art of the Sepik River (2015). This talk will discuss the artist’s past works that have engaged with museum collections and histories, including Murruwaygu: following in the footsteps of our ancestors , held at the Art Gallery of New South Wales and barrangal dyara (skin and bones) the 2016 Kaldor Public Art Project. This vast sculptural installation in Sydney’s Botanic Garden recalled the traumatic destruction of the Garden Palace that burnt to the ground in 1882, along with countless Aboriginal objects collected along the colonial frontier. Jonathan Jones is a Wiradjuri/Kamilaroi artist and curator. He works across a range of media and projects. At the heart of Jones’ practice is the act of collaborating and many projects have seen him work with other artists and communities to develop major projects. He is currently working with long time collaborator Uncle Stan Grant developing Wiradjuri gulbanha or Wiradjuri philosophy for a range of projects and is a senior researcher, University of Technology Sydney. This lecture will examine the ways in which indigenous art from the Pacific region has been collected and displayed at the Metropolitan Museum of Art in New York over the course of fifty years. Tracing the trajectory of the collection from its earliest beginnings under the auspices of Nelson Rockefeller to the present day, we examine the legacy of Rockefeller’s expansive gift of art from Oceania, Africa and the Ancient Americas in broadening the institutional scope of the museum and how it continues to redefine public perceptions of the role and agency of art today. Maia Nuku is Evelyn AJ Hall and John A Friede Associate Curator for Oceanic Art at the Metropolitan Museum of Art, New York. She was born in London and is of English and Maori (Ngai Tai) descent. Her doctoral research focused on early missionary collections of Polynesian gods and the cosmological aspects of Oceanic art. She completed two post-doctoral fellowships at Cambridge University as part of an international research team exploring Oceanic collections in European museums. Her current exhibition Atea: nature and divinity in Polynesia is in the Rockefeller Wing at the Met. Noŋgirrŋa Marawili is one of the most significant Australia artists working today. Working in Yirrkala, NT Noŋgirrŋa is interested in the atmospheric effects created as country is brought to life through the movement of wind, water or unseen forces. This talk examines Noŋgirrŋa’s reimagined practice and the careful trajectory over the course of her career, cautiously navigating inherited traditions and accepted modes of representation to arrive at her singular vision. Cara Pinchbeck is curator, Aboriginal and Torres Strait Islander art at the Art Gallery of NSW and the curator of the exhibition Noŋgirrŋa Marawili: from my heart and mind . Though remembered today as Australia’s preeminent abstract expressionist, during the 1950s to the 1970s, Tony Tuckson (1921-1973) was better known as a progressive arts administrator with a passionate interest in Aboriginal and Melanesian art and culture. He was employed at the Art Gallery of New South Wales for twenty-three years in various roles including deputy director. This talk will focus on the transformations of Tuckson’s artistic practice and the influence of his engagement with Indigenous cultures. Denise Mimmocchi is the Gallery’s senior curator of Australian art and curator of the exhibition Tuckson: the abstract sublime. The exhibition Melanesian art opened at the Art Gallery of New South Wales in April 1966, curated by the Gallery’s then deputy director, Tony Tuckson. Instrumental in forming the Pacific collection in 1962, Tuckson’s was determined to showcase Pacific art in a gallery context. This talk discusses Tuckson’s journey to the Sepik region of Papua New Guinea in 1965 and his relationship with Sydney businessman and collector of Pacific art, Stan Moriarty. Natalie Wilson is curator, Australian & Pacific art, at the Art Gallery of New South Wales. In 2014, she curated the exhibition Plumes and pearlshells: art of the New Guinea highlands, which featured 89 works from the Gallery’s world-renowned collection of PNG highlands art. Other exhibition projects include Justin O’Brien: the sacred music of colour (2010), and as guest curator for the SH Ervin Gallery, Peter Rushforth: all fired up (2013) and William Dobell: painter in paradise (2015). Join Art Gallery of NSW curators alongside Maia Nuku, Evelyn A. J. Hall and John A. Friede Associate Curator for Oceanic Art at the Metropolitan Museum of Art, as they consider the influence of individuals on the collections of major institutions. The discussion will include a focus on former AGNSW deputy director and preeminent abstract expressionist painter Tony Tuckson, who had a significant role shaping the Gallery’s Aboriginal and Torres Strait Islander and Pacific art collections, as well as the Metropolitan Museum’s Oceanic art collection.